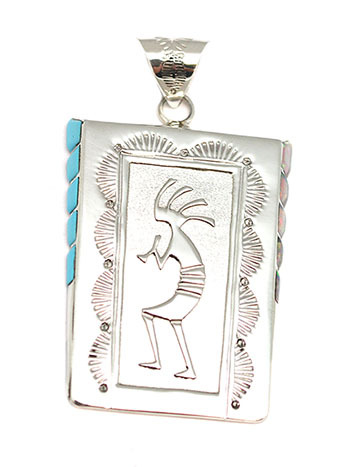 Sterling silver large kokopelli overlay pendant with etching, stamping and turquoise inlay sections on one side and synthetic white opal sections on the other side. It measures apporximately 2 1/2" long including bail by 1 3/8" wide at top and tapers to 1 1/4" wide. It is Navajo hand made by Leonard Jim. Currently only this one available.